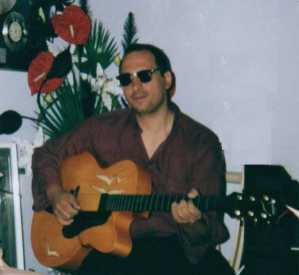 Self-educated musician, Serge Krief was born in Paris on July 10, 1962. 15 years old, Serge receives his first guitar. Initially influenced by flamenco, it is quickly allured by listening to Paco de Lucia, Al Di M�ola and John Mac Laughlin. In May 1982, thousand people can then discover him in the theater Marcel Pagnol de Villiers-Le-Bel. This concert will be followed in summer 1982 by a round trip in the south of France. Back in the capital, he performs in first part of Manitas de Plata's concert in September 1982, then turns again his attention to the Parisian clubs, winter seaside resorts and he also appears in his first radio transmissions. In 1983, Serge Krief discovers in him an unbounded taste for the jazz of Django Reinhardt, while also listening to Wes Montgomery, Charlie Parker, John Coltrane.. He is devoted, until 1987, primarily with an intensive technical training. Critics and artists will say whereas his technique is now irreproachable and his music irresistible. After several gigs in trio, quartet and quintet from 1987 to 1989, he finally appears on french television (Canal + in December 1989, France 2 in January 1990). January 23, 1990, in the famous "Salle Pleyel" of Paris in homage to Django Reinhardt, Serge Krief reconstitutes the legendary Quintet of Hot Club of France with Babik Reinhardt and Richard Chiche on guitars and Pierre Blanchard on the violin. January 26, the trio composed of Serge Krief, Richard Chiche on guitars and Thierry Colson on double bass is presented at the Casino of Paris where they really triumph. March 28, Krief gives an unforgettable concert in the SAVA CENTAR of Belgrade, having nearly five thousand people applausing his quintet. In June he performs at the Samois Festival in trio and makes a film for English television realized by John Jeremy: the well- know "Django Legacy", which will be diffused in France and in other countries. In August 1990, Serge Krief is involved in a film produced and realized by Alex M�tayer (Mohamed Bertrand Duval). He composes the musical sound-track of this film under the musical direction of Babik Reinhardt with Marcel Azzola (accordion), Luigi Trussardi (double bass), Richard Chiche (rhythmic guitar). In July 1991, Serge takes part at the "Grande Parade du Jazz" during the Jazz festival of Cimiez in Nice perfectly backed by his eternal accomplices, Richard Chiche and Thierry Colson. The trio in concert will be heard for his first appearance immediatly after the band of the famous saxophonist Bill Evans, and the following day just after the Trio of the guitarist John Mac Laughlin. This magic trio takes part in several studio cessions for film musics and shows and continuous its course while playing in several clubs in France and abroad. He also awarded the famous "Django d'Or" prize with the big band of Emmanuel Beix. In 1995 Krief is suddenly attracted by the modern jazz, but does not neglect therefore the music of Django. It is in July 1998, that Serge and Richard will make a decisive meeting in the person of the famous jazzman George Benson during the festival of Antibes. August 30, 1999, George Benson decides to introduce Serge Krief, accompanied by his faithful companion Richard Chiche, to the conoisseur public of the most famous New-York jazz Club the "Blue Note" as a special guests star group, the Blue Note public will be delighted. 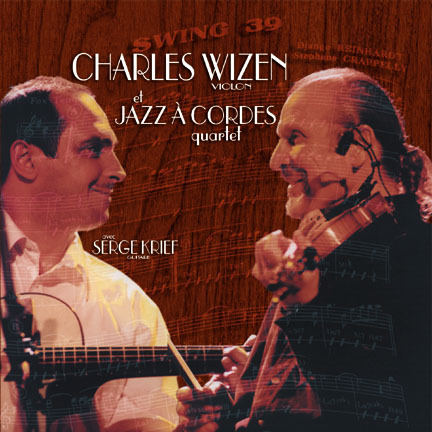 In november 1999 a CD has just been recorded in Sherbrooke Canada with the violonist of New York Charles Wizen and a second live recording should be soon planned. Finally a CD presenting Serge Krief !!! RECORDED : 06TH JUNE 1999 AT SHIPLAKE MEMORIAL HALL, NEAR HENLEY ON THAMES, OXFORDSHIRE. KRIEF'S TUNES : MINOR SWING,DANCE NORVEGIENNE, HONEYSUCKLE ROSE.